Even though the snow is still falling, we suddenly find ourselves within a month of the holy season of Lent. There are a number of ways of approaching Lent. One that is, arguably, among the most helpful, is to think of it as a time of remembering. We dedicate special time each day and each week to remember what our Lord willingly submitted to. And we remember what He gave us, in the process. It is an awesome thing to realize that God, Himself, set aside the glory, honor, and majesty of heaven to live as one of us. It is even more awe-inspiring to meditate on the perfect life He lived in every respect. And all that He suffered is almost unimaginable. Make sure you take the final step, however. Remember what Jesus did—and what it means for you. His perfect life is credited to you. He took on human flesh in order to have a body that He could offer as a sacrifice for your sin. He claimed you as His own to seat you, with Him, in heaven in glory and honor and majesty. We understand that better as we also remember the lives of the saints who have gone before us. What does it mean to live as one of God’s people? What was particularly important for them in their walk with God? What did they treasure? What did they have little time for or interest in? In what ways was their faith tested? That will be the focus of our Lenten preparation this year. In a word, it is about remembering: Remembering what He did; remembering their example; and remembering who you are in Christ. Start preparing to make the most of this upcoming Lent. We’ve been working our way through the book of Hebrews. I hope you’ve been following— and have benefitted from— our adult Bible study discussion, the Advent devotional, and the Advent midweek series. One of the things that we’ll be doing in the coming months, especially the Lenten devotions and midweek series, is spending time in Hebrews chapter 11– the chapter on the “Heroes of the faith.” These men and women really were tested in a variety of ways and, by their actions, showed where their faith truly lay. We’ll revisit their stories, learn how, exactly, they were tested, and see what God accomplished through them. As we hear their stories once again, we’ll be reminded what genuine ‘faith’ looks like. More importantly, we’ll be pointed to the object of their faith: Jesus Christ. Their faith was strong enough to accomplish remarkable things because the One in whom they placed their trust was most certainly trustworthy. It’s worth learning about the saints so that we can be encouraged by their example. But the greatest blessing is the evidence that their lives give that the One in whom you have put your faith really is more powerful than the devil, the world, and you sinful flesh— even more powerful than death itself. He has promised you seemingly impossible things— that you have been born again in baptism, that your sins are forgiven, that you have eternal life— and these stories reassure us that, as impossible as they seem, God’s promises are trustworthy. So please be watching for the Lenten devotional and the midweek series. Take full advantage of the opportunity to join us for adult Bible study, either in person or via the livestream on our Facebook page. Make the most of this opportunity to dig deeper into this wonderful section of God’s Word. A lot happens during the month of December. There are a lot of events, a lot of activities, and a lot of preparations. Among the carols, the cards, and the craziness there are also the declarations that: “Jesus is the reason for the season.” This is most certainly true. But what does it mean? How, exactly, should we adjust our attitudes or actions in response to this reminder? We often toss around phrases like this one that sound very nice, but leave a lot unsaid. There’s actually a lot to say about this simple phrase. Beneath the traditions, beneath the activity, there is a specific person that we’re getting ready to celebrate. We’re getting ready to celebrate the birth of Jesus. His birth is more than just an historical event that we are commemorating. It’s an event that has real meaning for you today. As our Advent theme puts it: The Greater One Is Coming. This Jesus who was born is greater than angels; He’s greater than Moses; and He’s greater than the Old Testament priests. It’s worthwhile to simply ponder the significance of that fact. But, as I mentioned above, this is something that has real meaning for you today. Angels are glorious. But He didn’t become an angel. He became one of us. He humbled Himself so that He could exalt you, with Him, to the right hand of the Father. Moses is the greatest of the Old Testament prophets. But Jesus is the greater prophet who leads you through the waters of baptism— destroying your spiritual enemies in the process— sustains you with bread from heaven and His living water while you travel through this wilderness, and gathers you safely into the Promised Land. The Old Testament High Priests literally served in the presence of God. But, because He offered the final sacrifice for the sins of all humanity, Jesus is God with us. The traditions and activities are all good and salutary— as long as they don’t come between us and the real meaning for the season: who Jesus is and what He came to do. Remember: Jesus is the reason for the season. Simply put, my goal this year is to help you discover the great treasure that we have in the book of Hebrews. The message of the book of Hebrews is quite stunning. The author (we're not sure who he was) takes familiar people or things from the Old Testament and uses them to show how much greater Jesus is. It really is stunning to understand the ways in which Jesus is greater than angels, Moses, and the High Priests. But (spoiler alert!) the part that is really mind-blowing is the implications for what Jesus has done for us. You've been exalted above the angels since He became one of us--not one of them-- in order to redeem you. He has given you a greater peace than anything that Moses promised the people. You have been made a kingdom of priests under your Great High Priest. The heroes of the faith? " All these, though commended through their faith, did not receive what was promised,  since God had provided something better for us, that apart from us they should not be made perfect" (Hebrews 11:39–40, ESV). It is truly an amazizng book. Or, to say it better, it is a book with an amazing message. You'll have several ways of diving into the book of Hebrews durng this school year. The main one is through our Sunday morning adult Bible study. That will be the best opportunity to work our way throught the message of the book together, ask questions, and find the answers that it offers. Even if you've missed the first sessions, it will most definitely be worth your time. We will also build on that study throughout the year. And we'll do it in a couple of ways. Our Advent and Lenten series this year will be based on the book of Hebrews. 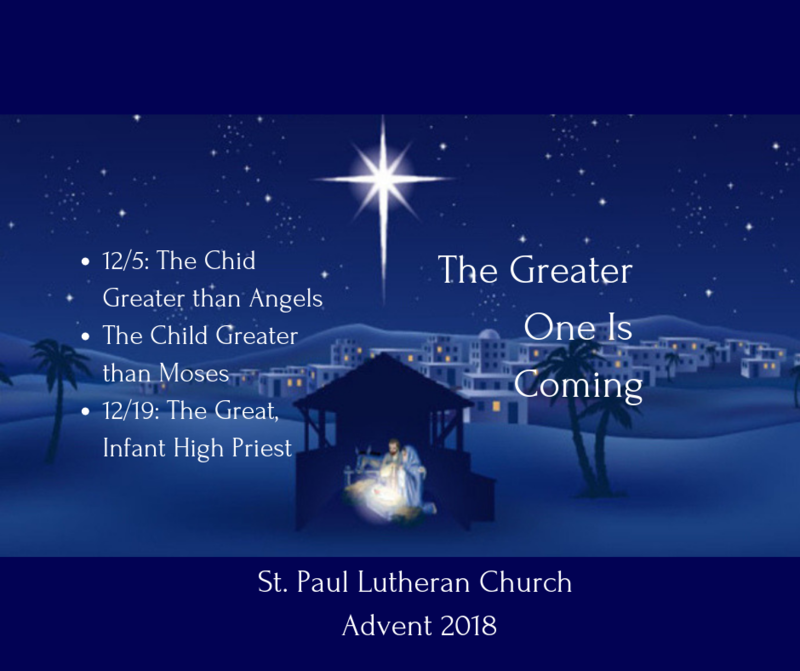 The theme for our Advent services will be "The Greater One is Coming: A Child Greater than Angels; A Child Greater than Moses; and the Great, Infant High Priest." We'll also offer an advent devotional based on that theme, as well. During Lent, our theme for our midweek services will be "The Heroes of Faith and Us-- Made Perfect In Christ: By Faith, Creation; By Faith, Abel; By faith, Enoch; By faith, Noah; By faith, Abraham & Sarah; By faith, Isaac, Jacob, & Joseph." Again, our Lenten devotional will develop that theme even further. Please don't miss this opportunity to discover and dig deeply into the amazing message of this book. May God richly bless our study of His Word this year. We’ve come to the end of another school year. As I write this, students are counting down to the first day of their summer vacation— and that number is well into single digits. As a pastor who has the privilege of teaching four days a week in our Lutheran School, I have yet to reach the end of the school year feeling like we’ve covered all that there is to cover. Without fail, I get to the end of the year feeling like there is still so much to cover, so much that they’ll need to know. That’s where the Good News of Jesus Christ leads, doesn’t it? Pure doctrine is nothing more and nothing less than the amazing revelation that Jesus Christ took your sins upon Himself and went to the cross to suffer and die for you. He now sends you out to love and serve others as He loved and served you. Coming to the end of the school year is a lot like coming to the end of a circle. Before we know it we’ll be back again for the start of another year. And it’s like coming to the end of the circle in another way: because faith and actions go hand in hand. We learn in order to do. We do according to what we’ve learned. Whether you have children who are still in school or not, I hope that you make the most of this opportunity to put faith into action.